In our previous posting on “How to Turn the Cord Cutting Trend into an Advantage”, we outlined how substantial video viewing time has migrated to internet-based platforms. This growth of online video has created new levels of complexity and uncertainty in the media buying and placement world, but also has brought new opportunity to those brands that have endeavored to leverage new media in their marketing plans. While both online video viewership and digital video ad spend have seen dramatic increases in recent years, both are still relatively small in relationship to television. Projections from eMarketer for 2014 estimated total US TV ad spend at $68.54 billion while the comparable figure for online video was $5.96 billion. And in terms of viewing, comScore has reported that total online video viewing hours in the US (excluding Netflix and adult video) amounted to only about 4 percent of total TV viewing hours for the first quarter of 2014. So, in terms of efficiently achieving reach and frequency targets, online video is not ready to supplant television. However, used wisely, online video advertising has an important role to play. The cord cutting post also showed that an ad that is effective when viewed on television is also highly likely to work well in an online video format and that video advertising on digital platforms can be as effective as advertising on television. In addition, when deployed in some of the following ways, online video advertising can bring benefits beyond what would be realized from television alone. Targeting: As marketers sharpen their consumer targets, they need their media to deliver the message to those consumers. Digital media is highly effective at reaching specific media targets. While digital is readily thought of as effective at targeting Millennials, who often spend more time with digital than traditional media, the same comScore study also illustrates how digital can be used to effectively target other segments. 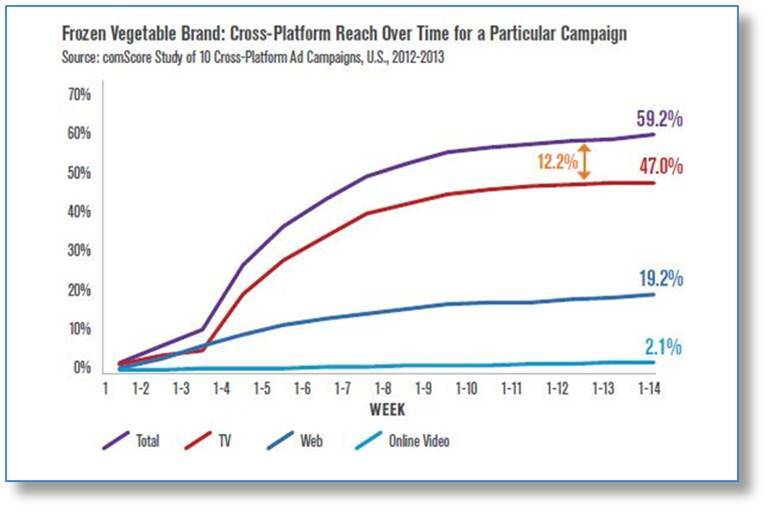 The following graphic contrasts the digital only reach of two different campaigns. 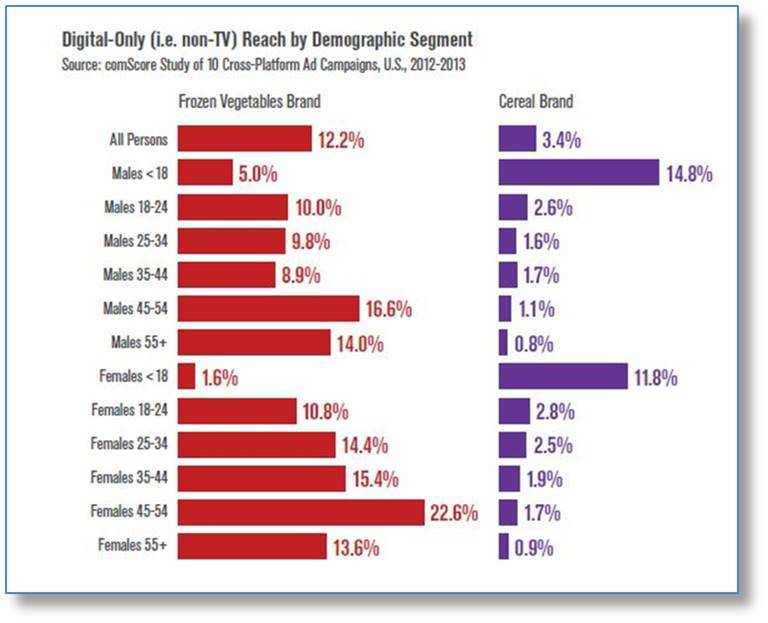 A cereal campaign strongly over-indexed among the under-18 segment, while a frozen vegetable campaign over-indexed among middle-aged viewers, especially women. And an engaged viewer is a receptive viewer. Studies by MSW●ARS have found that the effectiveness of advertising, in terms of its ability to persuade, is substantially enhanced when the media in which it is embedded is engaging to viewers. In fact, these studies have found advertisements to be 35 percent more effective among viewers who found the media content to be engaging versus those who did not. Long-Form Video: Many of the most popular (and shared) viral advertisements are classified as long-form video. These short films – often from 2 to 5 minutes in length – not intended for on-air broadcast have become staples on year-end “Best Ad” lists because they do something that has become difficult to do with the 15 and 30 second ad formats typical of on-air media – build an emotional connection through effective story-telling. As viral videos, long-form ads must be able to not only keep viewers attention but also convince viewers to share the video with others – no easy feat. But when effectively done, such a video can play an important role in establishing a brand’s identity in the minds of consumers and generating positive equity for the brand. An excellent example is the Scarecrow video from Chipotle. Released in September of 2013, it now has about 14 million views on YouTube. This striking video has created tremendous buzz for Chipotle, while also portraying the brand’s values in a way that effectively differentiated the chain from its competition. Chipotle recently reported year over year earnings growth of 27.8%. Enhancing E-commerce: A unique form of online video is the User Generated Product Review Video (UGPRV). These are reviews created by product users with their webcam or smartphone. The EXPO social media website curates these videos to allow marketers to easily distribute them onto e-commerce, owned, and earned media channels. Studies conducted by MSW●ARS have shown that UGPRV’s complement professionally produced advertisements since they provide enhanced product focus. Specifically, they are more apt to discuss a product’s convenience, quality and performance relative to competitive products. Copy testing of both a professionally produced and a user generated video (individually and in combination) for a particular brand demonstrates that this synergy is very real. And there is further evidence that these testimonies are compelling to viewers who encounter them on e-commerce sites such as amazon. 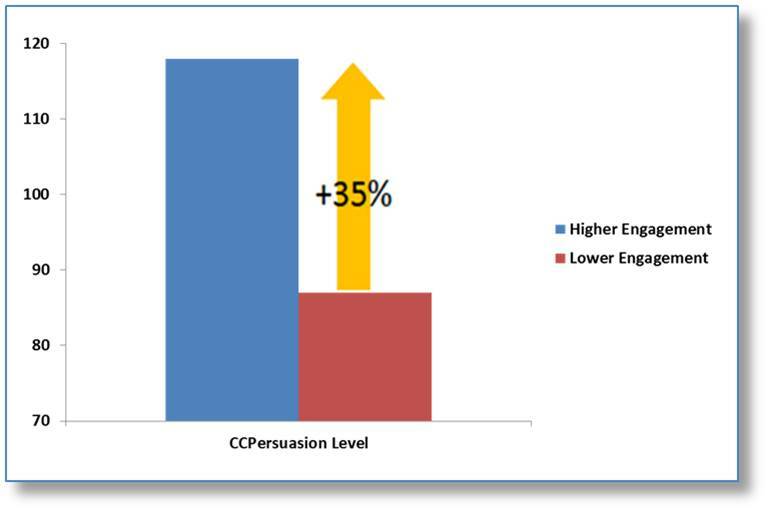 According to an MSW●ARS study conducted in conjunction with EXPO, visitors who viewed a UGPRV on an e-commerce site showed increases in both positive attitudes towards the product and purchase intent versus those who did not view the UGPV. This was particularly true among younger consumers. If possible, create original 15-second ads rather than cutting down longer existing ads. Not only is it a creative challenge to decide what to leave in and what to cut, but original 15’s have been seen to be more effective in studies of copy-testing results. Communication should be reduced to a single idea. There is insufficient time to effectively substantiate multiple key ideas. Use images and pictures instead of words. The time for words is limited, so strive for images that speak volumes. At least 3 to 5 seconds of product shots should be included. It is important to get to the point quickly and make sure the product comes through as the hero of the ad. “Storyline” formats should be avoided. These are very difficult to do well in less than 60 seconds, much less 15. When editing down longer ads, cut the correct content. Aim to cut scenes with little branding content, superfluous messaging or low interest. 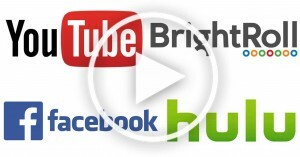 Online video is playing a growing role in advertisers’ total media mix. But as with any other advertising, the strength of the creative is key in ensuring the media spend is optimized. MSW●ARS has the tools to help advertisers ensure sales-effective creative regardless of media platform. Please contact your MSW●ARS representative to find out more.